Get to know Snipes Farm & Education Center in Morrisville, Bucks County PA! Not many families can say they’ve sustained their business for more than three centuries. But the Snipes family can. "For 11 generations, we’ve been proudly farming and feeding Bucks County," says Jonathan Snipes, co-founder and Executive Director of Snipes Farm & Education Center, 890 West Bridge Street, Morrisville, Pennsylvania. The Snipes family has a history in Bucks County that dates back to 1682, when ancestors, James and Joan Moon, immigrated here, part of a wave of Quaker refugees ﬂeeing religious persecution in England. Lead by William Penn, these Friends sought a life in the New World, where political and religious freedoms allowed the Light in each human being to shine. Since 1808, Snipes Farm has been situated in Morrisville; nestled amongst lush, mature trees, it is conveniently located right off of Route 1, just minutes from Yardley Boro, Oxford Valley shopping, and other popular lower Bucks County destinations. And while Snipes Farm has been an example of sustainable, organic farming for more than 300 years, it has also constantly evolved to meet the needs of the community it serves. 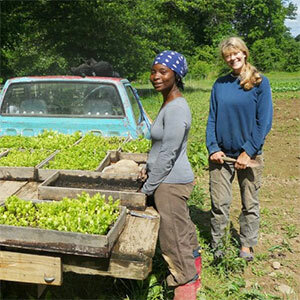 "We believe that the land connects us," says Melanie Douty-Snipes, who shares the stewardship of the farm with her husband, Jonathan, and sister-in-law, Susan Snipes-Wells. "It feeds us, and in working it together, we create a stronger community." That’s why in 2008, the Snipes Family offered the use of the farm for the establishment of Snipes Farm & Education Center, which offers year-round enriching educational opportunities for all ages. Snipes farmers and nurserymen have gifted Bucks County with a green legacy - the farm in Morrisville. Its long-standing service to the community is borne through teaching future generations about caring for the earth. The educational offerings at the farm encourage students of every age to be stewards of the land, to be thoughtful about their own health and the food they eat, and to be responsible, compassionate, and self-reliant. When you visit Snipes Farm & Education Center, you’ll always have fun while learning. It’s a pleasure to meet the animals. It’s exciting to pick up pesticide-free, naturally grown produce. Melanie, Jonathan, Susan, and the Snipes farmers and friends offer workshops for all members of the family. Recently, the Farm hosted workshops on beekeeping, keeping chickens in your backyard, cheese making, producing fermented foods, worms (for the kids) and more. A visit to Snipes Farm means you’ll ﬁnd many family-friendly activities, including themed festivals and seasonal events. Kids especially enjoy discovering the farm and all it offers. Fun and unique birthday party packages feature private hayrides, a corn maze, and feeding and petting the animals. And the ten-week Farm Summer Camp program lets kids become the farmers, planting and harvesting crops and caring for the animals. They also explore the natural beauty that surrounds the farm, play games, and make crafts. Farm fresh food is the best food. Snipes Farm & Education Center offers the community participation in their CSA (Community Supported Agriculture) program, where members purchase an affordable share of the season’s organic fruits and vegetables. "It’s a cost-effective, convenient way to bring fresh, local produce into members’ homes, and helps sustain local, organic farming in Bucks County," Jonathan explains. The farm’s website, www.SnipesFarm.org, has more details on its CSA program. While the CSA offers a great opportunity to enjoy fresh, local produce, Snipes Farm friends can also enjoy the delicious and healthy harvest by visiting the Yardley Farmer’s Market on Saturdays in Buttonwood Park in Yardley Boro. "We envision a world where everyone has access to healthy food, open space, and the experience of farming," says Jonathan. "With the preservation of small farms, and priority given to sustaining the earth and its natural resources, local economies and communities are strengthened. We’re proud to be a part of that." Content for this feature provided by MindShuffle.